The Comana Monastery, located in Comana Commune of Giurgiu County, was founded by Vlad Tepes in 1461, as a monastery-fortress, but fell into ruin before the end of the 16th century. The place that the monastery was raised on used to be an island, in the middle of swamps, and access was a gate to the North of the precincts, after crossing a wooden bridge, easy to burn in case of danger. 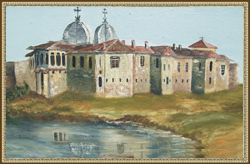 The Câlnistea River that flows in the Eastern part of the Comana village, meets the Comana swamp that it crosses and from which it separates in front of the monastery. In front of the Comana village, a water arm separates, surrounds the island and goes back to the old water bed. 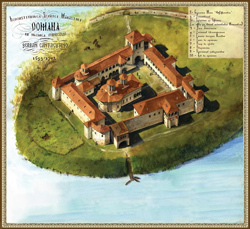 The researches performed on the first constructions of Comana, and the study of the documents of those times by several researchers, such as Cezar Balliac, Grigore Ionescu, C.C.Giurescu, and the analysis of the architects in charge of the restoration and consolidation of the walls reveal the fact that the Comana Monastery was founded by Vlad Tepes in the 15th century. A document of September 27, 1461 issued by Vlad Tepes's Chancellor's Office ordered "the limit (of the monastery) where it meets the Comana swamp, right in the Câlnita mountain lake". This is the first time when the Comana toponym is used officially. From this period the traces of a rectangular church (12 x 10m) were discovered, with its foundation made of brick and its higher part made of beams. The interior of the church was plastered and painted, and traces of red and dark blue paint were found. The monastery cells surrounded this small church. The archaeological excavations performed in the interval 1971-1972 partly discovered certain rooms, but the whole ensemble could not be reconstituted, not even graphically. Even if it was raised mostly of perishable material, this church with certain repairs performed by certain rulers lasted a century and a half, which proves once more the safety of the natural position of the land. Researches established that the necropolis around the small church had been used in the second half of the 15th century and the first half of the 16th century, a period that includes the ruling years of many rulers from Vlad Dracul to Neagoe Basarab, the central figure of this list, by the dynamics of its ruling and the fight against the Turks remaining of course Vlad Tepes, the first founder of the Comana monastery, recognized as part of a system thought and made not only as a prayer place, but also for the defence of the county by this important ruler of the 15th century.